Ed recently turned me on to Words With Friends. I play against myself, with a few strangers, and him. 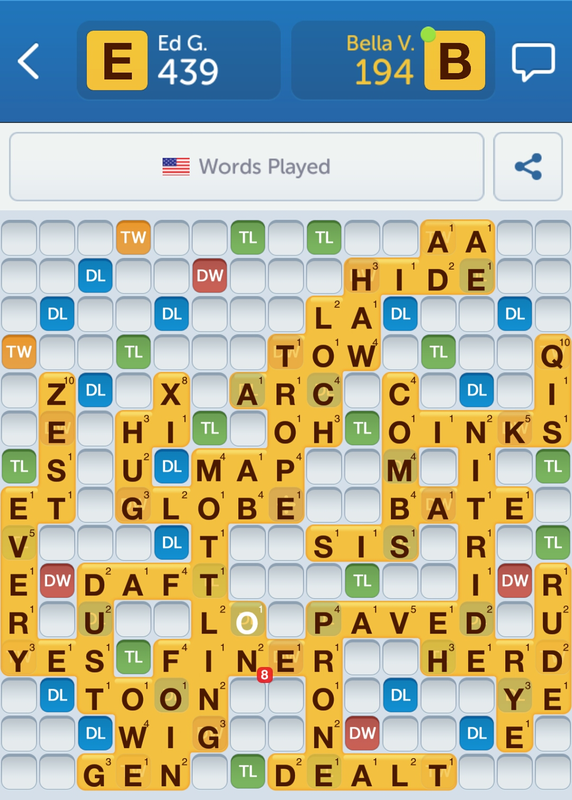 The occasions where I win against Ed (in Scrabble or the Words With Friends app) is so rare in the 12-plus years we've been together, I can count them on one hand. He's a master. Strategic, really. All those little groupings of two and three letter words? That's him. Words I've never heard of? Him. Words using all seven letters. Also him. The words they allow here are a little different than Scrabble, but it's a fun and challenging game and playing against others and against the app (called Solo Play) really gives one the opportunity to learn new words to use in future games. I'm getting better, but I'm not yet good enough to beat Ed.